Today (Friday 1st March) your GMB reps will inform COSLA that you have voted overwhelmingly to accept the latest pay offer. 2019/20 - an increase of 3 per cent. 2020/21 - an increase of 3 per cent. Your 2018/19 increase will be fully backdated to April 1st 2018. GMB will work with your employer to ensure you receive your backdated entitlement as soon as practically possible. The deal consolidates the living wage, ensures an increase of 6.5 per cent this year (3.5 per cent for 2018 plus 3 per cent for 2019), and the value of this deal is greater than what was implemented in NHS Scotland. These negotiations have been long and difficult and I would like to thank you for your participation and patience over the last year. Through our previous ballots we faced down a pay imposition and a further offer that continued to ignore the lowest paid. Last year COSLA said that their first offer was their only offer, so be in no doubt that without your efforts this deal would have been of less value to the front-line staff who need it most. I want to stress to you that our work is never done. Local government faces significant challenges in the face of Brexit uncertainty, continued austerity on our budgets and attacks on the terms and conditions of front-line staff and their services. Campaigning is a constant action for us and the defence of your interests does not start and stop with pay negotiations. Whether it’s fighting attacks on the pay of home carers in Dundee or tackling workplace abuse of school support staff in Aberdeenshire, our work continues. You will be aware we are currently balloting all our members across Local Government about the latest pay offer. The ballot will close one week today (Thursday 28th February 2019) and if you haven't voted it's important that you do. GMB are recommending you accept this offer as the best that can be negotiated without you having to take industrial action. We have secured more money for you during the pay talks and the commitment to consolidate the living wage across all thirty-two councils is a positive step for everyone as that will bring back the pay differentials between the bottom grades. 2018/19 - increase of 3.5 per cent (capped at £80,000, on or above which a flat rate of £1600 will apply). We have also written to COSLA to say that while we are recommending this offer if Brexit has a major impact on inflation and this deal turns into a pay cut in year three then we will demand talks to discuss what can be done to protect those on the lowest grades. Our priority is the defence of your interests - always. This is your pay deal so it's important that you have your say on it. GMB Scotland in Local Government – COSLA Pay Consultative Ballot Starts Today! GMB has spent the last year working hard to get you the best pay deal possible and as communicated to you last week, your GMB reps believe the final offer tabled by COSLA is the best that can be achieved through negotiation. GMB recommends our members vote to accept this offer in our consultative ballot, which starts today (Monday 4 February) and will end on Thursday 28 February. The ‘pros’ of this deal are the consolidation of the living wage, a de facto increase of 6.5 per cent this year (3.5 per cent for 2018 plus 3 per cent for 2019), and that the value of this deal is greater than what was implemented in NHS Scotland. The ‘cons’ are that we remain dissatisfied about the weighting of the deal between the low, middle and high earners and the suitability of a three year offer against the backdrop of Brexit uncertainty. We need to be clear that a rejection of this offer will mean moving to a strike ballot but we will always be honest with you; GMB will not play fast and loose with your livelihoods or lead you into a dispute with no real prospect of a positive outcome. Ultimately you will decide whether this offer is acceptable but we recommend you accept it as the best achievable through negotiation. We have served notice of our position to COSLA, which you can read here. COSLA is not prepared to move any further on the terms of the three year offer tabled – 3.5% for 2018 (backdated to April 1 2018), 3% for 2019 and 3% for 2020. The Finance Secretary Derek Mackay said the Scottish Government will not make any interventions on this. There isn’t a clear joint union position. Unison is recommending members accept and Unite is recommending reject in their non-craft members and accept in their craft-side. We wanted more for the lowest paid. We said we would exhaust every possible avenue through negotiation to get the best deal possible for our members but it is clear that we have now reached the end of that process. Yesterday (Thursday 24 January) your reps met to discuss and weigh-up our union’s position: GMB will recommend this offer to our members for acceptance as the best we can achieve through negotiation. A full consultative ballot of our local government membership will now run from Monday 4 February to Thursday 28 February where you will be asked to either accept or reject the offer. The ‘pros’ of this deal are the consolidation of the living wage, a de facto increase of 6.5 per cent this year (3.5 per cent for 2018 plus 3 per cent for 2019), and the value of this deal is greater than what was implemented in NHS Scotland. To mitigate Brexit uncertainty and the possibility of an inflation hike above the value of this offer, we have told COSLA that such a scenario should trigger fresh talks to ensure the earnings of the lowest paid (up to £36,500 a year) do not fall below the cost of living. However, we need to be clear that a rejection of this offer will mean moving to an industrial action ballot but without a united joint trade union position, an effective programme of industrial action that could change the employer’s position on pay does not look realistic. GMB will not play fast and loose with your livelihoods or lead you into a dispute with no real prospect of a positive outcome. We will always be honest with you. We feel this is the best deal we can achieve and that’s why we recommend you accept it. This has been a long and difficult year. Through our previous ballots we faced down a pay imposition and a further offer that continued to ignore the lowest paid. GMB secured a better deal for 2018 and the consolidation of the living wage will put more money into members’ pockets as we bring back the differentials between the lowest grades. While it doesn’t go as far as we would have hoped, we wouldn’t have achieved that without you and now all staff in the lowest grades across local government will benefit. GMB Scotland in Local Government – Important COSLA Pay Update! Tomorrow (Wednesday 23 January), the joint trade unions meet with COSLA and the Scottish Government once again. COSLA has indicated to us that they are not prepared to increase the terms of their latest offer – a three year deal proposing 3.5 % for 2018 (fully backdated to 1 April 2018), 3% for 2019 and 3% for 2020. GMB will push one final time for improvements that do more the lowest paid on the front-line of local services. It is important that we try and exhaust every possible way forward through negotiation. Improved offers in years two and three for staff earning less than £36,500. A cost of living guarantee for the lowest paid to offset Brexit uncertainty for the duration of the deal. Point 1 is self-explanatory and you would expect nothing less from your union on this. Point 2 means we will push COSLA and the Scottish Government to agree that if the cost of living (the rate of inflation) increases beyond the final offers tabled for 2019 and 2020, then the difference will be matched by COSLA and the Scottish Government. The Scottish Government has said it will not back a ‘blindfold Brexit’, so why should our members back a pay offer that could be compromised by that same Brexit uncertainty? This gives the lowest paid piece of mind that their pay would not fall below the cost of living. Your GMB local government reps will reconvene in Glasgow on Thursday 24 January where we will discuss the outcomes of tomorrow's meeting and deliver our recommendations to you ahead of a full consultative ballot. The priority of GMB Scotland is the defence of your interests. That’s why in the last year, we have been campaigning hard for COSLA to do more for the lowest paid in local government. The latest offer proposes for the vast majority of our members a 3.5% increase for year one; in years two and three they propose the same 3% that you comprehensively rejected in our previous consultative ballots. The unfair and unequal weighting of the offer (the same increases for all staff up to £80,000 a year and a cash increase of £1,600 for staff earning over £80,000) also remain and this is a major concern for GMB. Our sister unions have taken contrasting positions to the offer, with Unison recommending acceptance and Unite recommending rejection. After a decade of cuts we know how much you want a decent pay offer but the stakes are high. This weekend, school teachers may move to a strike ballot if they reject a pay offer which is greater than any other proposal made or deal agreed elsewhere in Scotland’s public sector. On Monday, NHS staff, now locked into a three year deal, will be balloted over reforms to their terms and conditions of employment that could result in cuts to real terms pay. And on Tuesday the UK parliament will vote on the Brexit deal which will have profound consequences for the future of public finances – just days after Derek Mackay warned of further cuts to Scottish frontline services. Why would we rush in on a three year offer when other public sector workers could receive a significantly higher award than council workers and when the future economic outlook is so uncertain? With all this in mind, we will meet the Finance Secretary and COSLA officials this Thursday 17 January in Edinburgh and GMB will make the case for further improvements to this offer. We want to exhaust every possible avenue of negotiation because in the event of a rejection the next step is a full strike action ballot of our members in local government. GMB Scotland has consistently demonstrated that we aren’t afraid to take on employers and politicians but it is never lost on us that when our members go on strike they lose money. We are a responsible trade union and we won’t play fast and loose with your livelihoods. Your GMB reps will reconvene on Thursday 24 January to make our determination and we will be in regular communication with you during the intervening period. Yesterday (Wednesday 19 December), GMB Scotland and our sister trade unions in COSLA received a revised offer from your employer concerning your pay deal. Under this proposal, the Scottish Local Government Living Wage will rise annually by the percentage uplifts referred to above and COSLA have also committed to a consolidation of the living wage across all council’s by March 2021. Your GMB local government representatives will confirm our position in early January over whether to recommend an acceptance or rejection of this offer before confirming dates for a full consultative ballot of our 30,000 local government members. We know the delay in the delivery of a decent pay deal along with the prospect of a third ballot in nine months will be a source of huge frustration for you, but it is vitally important that any offer is subject to the full scrutiny of our members. Our initial reaction is that progress has been made, as it stands this offer would surpass the value of the recent NHS deal, but our long-standing concerns remain about how this offer is weighted across the local government pay grades. Thank you for joining GMB - Scotland's campaigning trade union. Our priority is the defence of our members’ interests. That’s why we asked you to vote yes for industrial action and for better pay against COSLA’s unfair and unequal offer. Our ballot count overseen by your local government reps last month showed that GMB members voted YES in support of industrial action by an overwhelming 85 per cent. That result is a loud and clear message to both COSLA and the Scottish Government: They must do more for the lowest paid in our councils. The priority of GMB Scotland is the defence of our members’ interests. That’s why we asked you to vote yes for industrial action and for better pay against COSLA’s unfair and unequal offer. I can confirm that following a ballot count overseen by your local government reps today (Friday 16 November) in Glasgow, GMB members voted YES in support of industrial action by an overwhelming 85 per cent. The result sends a loud and clear message to both COSLA and the Scottish Government: They must do more for the lowest paid in our councils. The employer will be notified this afternoon of our result, as will our sister trade unions in local government. GMB Scotland in Local Government – COSLA Pay Latest & Last Call for Postal Ballot! The priority of GMB is the defence of your interests. That’s why your union has led from the front in the campaign for better pay across Scottish local government. A 3 per cent increase to all employees earning up to £80,000. A flat rate increase of £1,600 for all employees earning more than £80,000. No new money is being put into the pockets of staff earning up to £36,500. Every penny of an estimated £10 million of extra funding from COSLA has been given to staff earning £36,501 - £80,000. It is totally unacceptable and nothing has changed for the lowest paid. Last week our sister unions Unison and Unite rejected the COSLA pay offer, joining GMB members position. There is now a strong consensus among local government staff that more must be done for the lowest paid. Union reps met with COSLA chiefs on Friday 9 November and we were clear with the employer-side that a failure to find more money for the likes of carers, cleaners, caterers, refuse workers and pupil support staff makes industrial action more likely. COSLA said they ‘do not have a mandate’ to make an improved offer but ‘will work behind the scenes to see what they can do’. We are rapidly running out of patience and COSLA rapidly running out of time to do the right thing. That’s why we have been urging GMB members to VOTE YES in our consultative ballot for industrial action in COSLA. Our ballot closes this Thursday 15 November. You have voted in great numbers in your workplaces over the last few weeks and postal ballot returns have also been strong. And if you received a postal ballot and haven’t yet returned it, don’t delay – return it today! GMB Scotland defending your interests. That's why we're fighting for better pay for Council workers at Dumfries and Galloway. The turnout for voting has been good, but we can still do better. If you haven't voted at your workplace, I would urge you to do so at the earliest opportunity. Those of you who have had a postal ballot form sent to you, please complete and return the ballot form as soon as possible. COSLA has already been forced back to discussions once before because of the message they received from GMB members. The fight is not yet won, the battle is not over. The offer COSLA have on the table is simply not acceptable. We must send a clear message to COSLA: Council workers deserve better! GMB Scotland in Local Government: COSLA Pay Ballot - Postal Ballot Update! Our consultative ballot of local government members over the latest COSLA pay offer is well underway. In the next few days, you will receive your postal ballot paper to your home address. We are asking you to VOTE YES for industrial action against COSLA’s latest unfair and unequal offer and to campaign for a better deal for the lowest paid in our councils. Our ballot runs until Thursday 15 November but please, don’t delay. Return your ballot as soon as possible using the freepost envelope provided. No new money is being put into the pockets of staff earning up to £36,500. Every penny of an estimated £10 million of extra funding from COSLA has been given to staff earning £36,501 - £80,000. It is totally unacceptable. For full-time staff on the front line of council services (like home carers, refuse and recycling workers, school cleaners and pupil support assistants) it means exactly the same as before. Nothing has changed in this latest offer. After ten years of cuts to pay and after a massive rejection of the original pay offer it’s clear that COSLA is treating our members across local government with total contempt. That’s why we are asking you to VOTE YES for industrial action and for a better pay deal in your postal ballot. P.S. Remember! GMB is asking you to VOTE YES for industrial action and for a better pay deal. GMB Scotland in Local Government – COSLA Pay Ballot Starts Today! Our priority is the defence of your interests. That’s why we are asking you to VOTE YES for industrial action against COSLA’s latest unfair and unequal offer and to campaign for a better deal for the lowest paid in our councils. No new money is being put into the pockets of staff earning up to £36,500. Every penny of an estimated £10 million of extra funding from COSLA has been given to staff earning £36,501 - £80,000. For full-time staff on the front line of council services - like home carers, refuse and recycling workers, school cleaners and pupil support assistants - it means exactly the same as before, an average increase of £500-£600. Nothing has changed in this offer. For staff on over £36,500 it means a £1,000 increase – an extra £370. For staff on over £70,000 it means a £2,200 increase – an extra £700. For the council top brass it still means a £1,600 increase on their six figure salaries. That’s why we are asking you to VOTE YES for industrial action. We need to make COSLA think again and come back to the table with a better offer for those that need it most. GMB’s consultative ballot will run until Thursday 15 November. Ballots will take place in the workplace wherever possible so please look out for local updates. If we can’t reach your workplace you will be balloted by post. GMB Scotland in Local Government – Important COSLA Pay Offer Update! A flat rate increase of £1,600 for employees earning more than £80,000. Despite being told by COSLA and the Scottish Government that the initial offer rejected by GMB members was a ‘final offer’, an estimated extra £10 million of funding has been sourced and allocated entirely to the middle earners in local government. COSLA’s leaders have ignored the voices of the lowest paid in local government. This revised offer does nothing to help staff like home carers, refuse workers, school cleaners and pupil support assistants. What COSLA have done with this offer is merely reinforce the fact that they value the highest and middle earners more than staff on the front-line of our vital local services. Ultimately, the biggest cash rises will go to the middle and highest earners, and not those on the lowest grades who have suffered the most after ten years of austerity. This is unfair and unequal – and absolutely shameful. Over the coming days, GMB Scotland will set out our next steps but we are clear that COSLA must do more for the lowest paid in local government. GMB Scotland in Local Government – COSLA Pay Update! The priority of GMB Scotland is the defence of your interests. That’s why, following the overwhelming 92% rejection of the unfair COSLA pay offer, your GMB reps have been meeting to discuss the next steps in our campaign to deliver a fair deal for local government pay. Our message has been clear and consistent: We cannot allow those earning over £80,000 a year to get as much as eight times more than what the majority of our members can expect from a 3% rise – that’s unfair and unequal. There shouldn’t be a politician in the country that believes the COSLA offer is fair or credibly tackles a decade of cuts to your pay and conditions but regrettably there are, including Finance Secretary Derek Mackay MSP who believes the offer treats staff with “equal value”. It’s a position that Derek Mackay maintained at the most recent Holyrood meeting between the local government joint trade unions and the Scottish Government, where he also said that he is not willing to put any more money into local government. So it’s very clear to GMB that if we want to put more pounds into the pockets of the lowest paid across COSLA then we are going to have to step-up our campaigning agenda, which is what your reps have resolved to do. We are not a trade union to sit and wait for change. It’s time to hit the pressure points of our employers and politicians. And yes, we will now explore the potential for a programme of targeted industrial actions across key sectors and councils within COSLA. Very shortly, we will bring forward a plan of action for each local authority where we will campaign to raise awareness of this unfair and unequal pay offer and to hold the decision makers to account. We will be in regular communication so if you want to receive our campaign updates for events in your local authority, then please make sure your contact details (especially mobiles) are to up to date. Changes to the notional working day. As a result of this, GMB has agreed to lift our strike action in refuse and recycling which was due to run from Thursday 12 to Sunday 15 July. This strike is now suspended. Staff in waste and recycling at Hilton and Mavis Valley should report to work as normal. The council has also agreed to enter into negotiations over their cuts to redundancy entitlement. GMB has set a deadline of Monday July 23 for the satisfactory conclusion to this, during which our mandate for industrial action is protected. The overtime ban across all services remains in place. Make no mistake that today’s developments are a massive step forward in our campaign to defend your terms and conditions. We still have some road to travel on the issue of redundancy entitlement but the ball is now firmly in the court of the council to resolve this. We will hold them to account. GMB Scotland has led this campaign from the front. Through your magnificent solidarity you have stared down this council and their shameful attack on your terms and conditions. We will be in touch with further updates as they happen but I wanted you to know of this development as quickly as possible. GMB members rejected COSLA’s pay offer by a resounding 92%. You did this on the basis that we cannot allow those earning over £80,000 a year to get as much as eight times more than what the majority of our members can expect from a 3% rise – that’s unfair and unequal. That’s the message personally delivered by your fellow member, Shona Thompson, a Home Carer in Cordia Services Glasgow, to the Finance Secretary Derek Mackay on Tuesday 26 June, during talks at the Scottish Parliament. Our priority is the defence of your interests and we take a no-nonsense approach to politics. That’s why it’s important for our members like Shona, to be able to look our political leaders in the eye and tell them that you deserve better. It is regrettable that once again the Finance Secretary told us that the current offer is “fair and equal” in its treatment of local government staff, and that there is no more money left to give to COSLA from the Scottish Government. GMB profoundly disagrees with the Derek Mackay. More must be done for the lowest paid in after ten years of cuts and pay freezes. That’s why we recommended that he could release some of the £119 million that has been placed in reserves after last year’s budget underspend. Derek did say however, that he would be happy to attend the next round of talks between the local government trade unions and COSLA. We hope that is the least of his actions in the coming weeks regarding your pay. So GMB is clear that COSLA and the Scottish Government need to return to negotiations with the joint trade unions as soon as possible. They can and must do more to put more pounds in your pocket. That's why we urged you to reject the unfair COSLA pay offer, sending a message to the employer and the Scottish Government that they must do more for our lowest paid council staff. Your response couldn't have been clearer: GMB Edinburgh members played a big part in a resounding 92% rejection of the COSLA pay offer. You can read more about our ballot result here. Myself and my colleague David met many of you in the different workplaces that we could visit around Edinburgh to conduct the ballot. It was great to meet so many of you in person and hear the reasons why you wanted to reject this year's pay offer. GMB Scotland will keep you updated and make sure your voice is heard on your pay. GMB Scotland in Aberdeen City Council – PSA ‘Abuse at Work’ Campaign Update! · Over 90 per cent of PSAs have suffered verbal or physical abuse at work. · Nearly a quarter of PSAs do not know how to report this abuse. · Over 70 per cent of PSAs have not been trained on how to report abuse. · Nearly three quarters of PSAs who have reported abuse received no feedback. As a result of our campaign, we have met with ACC’s Chief Executive and we have a further meeting scheduled for Friday 29 June with the council’s health and safety team over your welfare at work. · Our schools must be safe places for the staff who work there - violence and aggression at work can never be accepted as normal. · There needs to be a far greater respect and recognition for the massive contribution support staff make to our kids’ education and wellbeing. · Aberdeen City Council must work with GMB Scotland to bring forward new policies for safety at work to urgently tackle this growing crisis. While discussions with ACC so far have been positive, let’s also be clear that actions speak louder than words and we will measure ACC on their willingness to meet these challenges. The priority of GMB Scotland is defence of our members’ interests. That’s why we have surveyed, engaged and consulted with you extensively since late last year about your expectations for your pay and conditions. A flat rate increase of £1,600 to employees earning more than £80,000. After the close of our consultative ballot on Friday 15 June, and having counted the returns with your GMB reps yesterday (Monday 18 June), GMB members in Scottish local government and ALEO bodies have rejected the COSLA offer by 92 per cent. GMB has written to COSLA and the Scottish Government Finance Secretary Derek Mackay, telling them to listen to your voice over this unfair and unacceptable pay offer. The challenge to the employer-side and the Scottish Government remains clear: Do they really think that a council chief executive is worth £1,000 more than a home care worker, bin collector or school cleaner? Our trade union doesn’t think so but, as it stands, Derek Mackay thinks this offer gives council workers ‘equal value’. GMB thinks he should look at the scale of this rejection and realise that the truth on the ground is very different than his view from the privileged political bubble. The ball is now firmly in the court of COSLA and the Scottish Government, but your local government reps will meet shortly to discuss the next steps of our campaign and be assured that your trade union is not going to wait and hope for change. We will campaign together. GMB Scotland in Local Government – COSLA 2018/19 Pay Ballot! 1 week to go! Over the last few weeks, we have been balloting our members in local government, urging you to REJECT the COSLA pay offer for 2018/19. GMB simply cannot recommend a deal that increases the pay of the highest grades by £1,600 while staff on the lowest grades get between £250 and £600. It begs the question: Is a Chief Executive worth £1,000 more than a home care worker, bin collector or school cleaner? GMB doesn’t think so. If you agree with us, you've only got one more week to return your ballot paper. Our ballot closes next Friday 15 June. Many of you will have already cast your ballot in your workplace or by post. But if you haven’t yet returned your postal ballot, then now is the time. You deserve better! Let’s campaign to bring COSLA and the Scottish Government back to the negotiating table and deliver a fairer offer for the lowest paid in local government. That’s why over the last year we have been campaigning hard to ensure that our members delivering housekeeping services at Police Scotland’s Tulliallan Headquarters received a proper living wage for their work and skills. In April, the changeover of the soft services contract at Tulliallan from Mitie to Sodexo resulted in the delivery of that living wage, in line with the Scottish Government’s fair work agenda for public services, providing a basic £8.75 an hour for our members. Regrettably it has now come to light that the price hard-working staff will pay for that uplift is a change in shift patterns to 5 over 7 and a cut of 187.5 hours a week to cleaning and housekeeping services (hours which currently equal approximately six jobs). GMB is clear: This is an unacceptable imposition to your livelihoods; it’s giving with one hand and taking away with the other and both Police Scotland and Sodexo are to blame. We will campaign to stop these cuts. Over the last few years, Police Scotland have blown hundreds of thousands of pounds of taxpayers money to feather the nests of its most senior staff – but they can’t even ensure that the staff keeping their HQ clean and orderly have fair terms and conditions. That’s why we will soon launch a consultative ballot for industrial action against these cuts, which GMB were not consulted over by your employer. If Police Scotland cannot get together with Sodexo to stop these cuts, not only will they face embarrassing strikes at Tulliallan but they can make their own beds and lie in them while it happens! In the meantime, if you have any questions please do not hesitate to contact me at Christina.Lambie@gmb.org.uk or call our Falkirk Office on 01324 670676 (during office hours). That’s why yesterday (Thursday 10 May), along with me, your fellow GMB member Dinah Turnbull, a cleaning supervisor in Falkirk Council, took our COSLA pay campaign for to the Scottish Government and Derek Mackay. GMB cannot support a deal that increases the pay of the highest grades by £1,600 a year while staff on the lowest grades get between £250 and £600. It is unfair and unacceptable - that why we are urging you to reject the COSLA offer. Yesterday, Dinah pressed Mr Mackay on the pay offer: “Did he think that she was worth eight times less than her boss?” Mr Mackay’s response was that the lowest paid and the highest paid in local government are “equally valued”. Unfortunately, it would seem that Mr Mackay thinks that some local government workers are more equal than others. That’s why we need to send a clear message to COSLA and the Scottish Government that they must do more for the lowest paid in local government. You can do this by strongly rejecting the COSLA offer in our live consultative ballot. After ten years of cuts to pay, conditions and services, you deserve better. Our consultative ballot runs until Friday 15 June. GMB organisers and reps are conducting workplace ballots. Postal ballots for members in remote areas will be sent over the next week. P.S. Remember! GMB is urging you to reject the COSLA offer - it is unfair and unacceptable. GMB Scotland in Local Government – GMB recommends members REJECT the COSLA Pay Offer! Consultative ballot starts Monday 7 May. The priority of GMB Scotland is the defence of your interests. That’s why GMB is urging you to REJECT the COSLA pay offer for 2018/19. A 3 per cent pay increase will apply to all employees earning up to £36,500. A 2 per cent pay increase will apply to all employees earning £36,501- £80,000. After a decade of cuts to your pay, conditions and services, a 3 per cent increase might seem like a good offer. But the devil is in the detail! Left unchallenged, this would increase the pay gap between the lowest and highest earners in local government, with obvious consequences for pay inequality too. In our recent survey you told us that your living standards are worse now than five years ago, that you are working longer hours with less resource and for less money in real terms. As it stands, COSLA’s pay offer is unfair and unacceptable. That’s why GMB strongly recommends that you REJECT this offer in our consultative ballot. The consultative ballot starts on Monday 7 May and will run until Friday 15 June. This will be conducted in your workplace but certain members in remote locations will receive papers by post. You will be asked: "Do you accept or reject the COSLA offer of 3 per cent for the lowest paid and £1,600 for the highest paid?" GMB strongly recommends you cross the box which says ‘REJECT’. That’s why after last week’s 100 per cent vote to take action to save Beechgrove from closure we must now ramp up the pressure with NHS, PKC and the Scottish Government to ensure Perth has at least one publicly owned care home. We now need to get all the staff involved in this campaign to send the council and the Scottish Government a clear message that Beechgrove must stay open and remain in public hands. Please speak to your colleagues that are non GMB members and ask them to join because when we start the legal process to take action it will only be GMB members that have the legal protection to do so. Your local GMB will be onsite shortly but in the meantime, if you have any questions then please do not hesitate to contact me at vicki.leonard@gmb.org.uk or call our Dundee Office on 01382 225491. · A flat rate increase of £1,600 to employees earning more than £80,000. Your GMB local government reps met today (Thursday 12 April) to discuss the above offer and have determined that in the forthcoming consultative ballot we will recommend our members REJECT this offer, as it stands. We cannot recommend support for a pay offer that has not been negotiated in any way with the trade unions and would result in a part-time cleaner receiving about £250 over the year, a home carer receiving £528 compared to a chief executive receiving £1600. Left unchallenged, this offer would increase the gap between the lowest paid and the highest paid in local government with obvious consequences for the gender pay gap too. It is unacceptable. In our recent survey you told us that your living standards are worse now than five years ago, that you are working longer hours, with fewer resources and for less money in real terms. That’s why GMB pushed for significant uprates of pay in the COSLA pay claim, which proposed a £1500 increase across the board or 6.5% (whatever is higher) and after a decade of austerity on your pay, jobs and services, the COSLA offer is well wide of the mark. GMB will now finalise preparations for a full consultative ballot of our local government membership, which will take place throughout May and June. Wherever possible, we will conduct workplace ballots. Your GMB Scotland representatives met with COSLA today to discuss your pay for 2018/2019. A 3% pay increase will apply to all employees earning up to £36,500. We have stated that we expected more and that this is a move away from ensuring the living wage employees get the biggest increase to lift more members out of a poverty wage. Despite COSLA stating that this is their final offer, GMB Scotland continued to argue for a better deal for you and for an increase of the amount paid to the lowest earners. As it stands COSLA’s offer would mean that a chief executive is getting £1600 and the cleaner of his/her office could get £500 at best. We have been advised by COSLA that they are keen to work with us to look at how they can provide free sanitary products for female staff and this is a positive step that responds to issues that members have told us about in the workplace. GMB Reps will meet on Thursday 12 April to decide if our union should recommend accepting or rejecting this deal. We will then proceed to a consultative ballot. Ahead of this meeting, please do not hesitate to contact me at GMBScotCampaigns@GMB.org.uk, or speak to your GMB Rep, if you have any questions. GMB Scotland in Cordia - Important 2018/19 Pay Update! Glasgow City Council and Cordia’s leadership have now confirmed that Cordia will be included in this year’s COSLA pay negotiations. COSLA is the body that represents Councils across Scotland. In previous years, because of Cordia's ALEO status, Cordia has had separate pay negotiations and pay offers. This year, Cordia members will be included in GMB Scotland's national pay campaign as pay talks start this week. Below is an update for all GMB members of our position ahead of these talks. Following our survey, you were clear that you need more money in your pocket. Many members told us they are working extra hours to make ends meet and to feed their families. Cuts to staff levels in your services mean you are often doing the work of two or three people. You are working longer and harder against the rising cost of living and this cannot continue unchallenged. • Free sanitary products available in every female bathroom in every council building. You’ve made it clear that pay is your priority and this claim would make a significant difference to the livelihoods of our members, particularly the lowest-paid in our councils, after a decade of brutal austerity cuts. Equality must also be at the core of everything we do as a trade union. As a union and a movement, another generation of equal pay injustice doesn’t bear thinking about. That’s why a commitment to equal pay, conditions and practices are at the heart of this claim. And you’ll also see that GMB had called on COSLA to ensure all female employees have access to free sanitary products. Period poverty is a growing concern for many members and it has to be tackled. It’s an unarguable issue of dignity at work and basic social justice. Our priority is the defence of your interests - pay, equality and dignity. That’s what GMB is campaigning for in local government. Pay talks are scheduled to begin this Wednesday 28 March. We cannot put a timescale on these negotiations but please be assured that you will vote on the final offer through a consultative ballot. Last year, GMB led the way for the first decent pay increase for the lowest paid in local government in a decade. This year, we are campaigning for more progress and to tackle Scotland’s austerity shame once and for all. That’s why it’s never been more important to be a GMB member and to get involved in Scotland’s campaigning trade union. Please make sure your contact details are fully to up to date with your local GMB reps (particularly mobiles and emails) as we will be in constant communication! P.S. Remember! Our priority is the defence of your interests - pay, equality and dignity. That’s what GMB is campaigning for across local government. GMB Scotland in Local Government - Important 2018/19 COSLA Pay Update! COSLA leaders meet today (Friday 23 March) to look at how they will respond to the local government joint trade unions’ pay claim for 2018/19. That’s why its never been more important to be a GMB member and to get involved in Scotland’s campaigning trade union. Please make sure your contact details are fully to up to date with your local GMB reps (particularly mobiles and emails) as we will be in constant communication! P.S. Remember! Our priority is the defence of your interests - pay, equality and dignity. That’s what GMB is campaigning for in local government. Tomorrow Clackmannanshire Council will set its budget for 2018/19. Councillors will decide whether to rip up your existing contracts of employment and impose cuts to your terms and conditions. This cuts plan by the council’s minority administration would mean the removal of your unsociable working hours payments and your overtime rates of pay – a pay cut for GMB members delivering local services like social care and school support. This is just the first step in an estimated £29 million worth of budget cuts between now and 2020. Left unchallenged this will mean already hard-pressed members working longer and harder for less. Join us and let’s send the strongest possible message to the ruling administration and councillors of all political parties that this cuts plan is unacceptable and if it is supported, they will stand in direct confrontation with GMB Scotland. Glasgow City Council’s budget announcement that home care services will be returned to full council control is a welcome development. It’s something GMB has long campaigned for. This presents a huge opportunity to review long-standing issues that go beyond pay disparity. However, the break-up of Cordia’s services is not a quick-fix to the challenges facing us and it does come with a deal of uncertainty. Now, more than ever, it is so important that we are on the front foot and campaigning for a service that recognises and rewards you for the professionals you are, while delivering the best standards for the service user too. That’s why on International Women’s Day, Thursday 8 March, GMB will launch our campaign for a full review into working patterns for home carers in Glasgow. Watch out for updates via SMS and email! The return of home care services to council control is not the end of our fight; it’s just the beginning. Glasgow City Council’s budget announcement that Cordia’s services will be returned to full council control is a welcome development. It’s something GMB has long campaigned for. This is a huge opportunity to review long-standing issues that go beyond pay disparity. However, the break-up of Cordia’s services is not a quick-fix to the challenges facing us and it does come with a deal of uncertainty. Now, more than ever, it is so important that we are on the front foot and campaigning for future of your livelihoods. After ten years of austerity cuts, it’s time you received the proper recognition and reward for the work you do – equal and proper pay, job security and increased investment in resources. The return of Cordia’s services to council control is not the end of our fight; it’s just the beginning. This morning (Monday 12 February) your GMB stewards counted our workplace consultative ballot, undertaken by the Blue shift on Thursday and Friday and the Red shift on Saturday and Sunday. It is clear that GMB members won't stand for a 12% cut to cleansing. Our hope was that GCC would see sense and do the decent thing but it has become clear that Councillor Dalton has no intention to protect and extend the contract of temporary workers and there is no plan to deal with the extra work. That only means one thing: they expect the remaining workforce to take on the work. That means an extra 12 per cent work on everyone's shoulders. Make no mistake; this is the thin end of the wedge for the future of your service in public hands. Here and below is the letter Councillor Dalton sent in response to our previous letters. Also here and below is our response. Today we have served notice to GCC that we are officially in dispute. In 7 days ballot papers will be sent to your home. GMB Scotland is urging everyone to vote YES to both options in order to defend your interests and to protect cleansing services for the long term. Over the last year GMB Scotland has been campaigning hard to defend your interests. We are clear that the increasingly challenging working conditions facing our members employed in the various school support staff roles is the untold story of the Scottish education system. The state of education in Scotland is never far from the headlines. But what our political elite in Holyrood are not talking about is the rise in abuse and assault against classroom assistants or the growing disparity in pay and conditions between janitors and cleaners because of PFI-related contracts. The Scottish Government’s recent consultation, ‘Empowering Schools’, The Education (Scotland) Bill, was an opportunity to start tackling these serious problems. But instead of bringing forward proposals for badly needed investment to boost jobs, pay and services for support staff, the focus was instead placed on the removal of power from local authorities. It would seem the direction for the Scottish Government is to put more power into the hands of individual Head Teachers or Regional Collaborative bodies. This is an open door for increasing privatisation of non-teacher services and the attack on terms and conditions of staff. GMB believes these proposals will pile more pressure on you – and you are already hard pressed enough. There needs to be a far greater respect and recognition for the massive contribution support staff make to our kids’ education and wellbeing. You can read our full response and media statement to the Education Bill here . GMB Scotland’s local government delegates have today (Friday 12 January) agreed to submit a pay claim to COSLA on your behalf, alongside the other joint trade unions in Scottish local government (Unison and Unite). The joint trade union pay claim submission calls for a flat £1,500 increase or 6.5 per cent increase (whichever is greater) across all local government pay grades (based on a 37 hour working week) for 2018 /19. Against the backdrop of a six year high in the cost of living and a decade of imposed austerity measures on your pay, this would deliver a significant pay rise for hard-pressed local government staff - and particularly for those on the lowest pay grades. GMB and our sister trade unions in local government will formally table this claim at the COSLA AGM this afternoon, where we will also call for a ‘no compulsory redundancy’ commitment across all thirty-two local authorities. Today marks the start of negotiations with COSLA for your 2018/19 pay offer. Please be assured that any credible or final offer tabled by COSLA will be subject to a full consultative ballot of GMB members. The priority of GMB Scotland is defence of our members’ interests and we will oppose any attempts to make you poorer, privatised or redundant. The priority of GMB Scotland is the defence of our members’ interests – always. That’s why we have been campaigning to highlight the untold story of Scottish education: The rise of violence and aggression in classrooms against school support staff and the increasing challenges and demands of the job. Freedom of Information (FoI) research conducted by GMB showed that in 2016 there were 1,113 reported incidents of violence and aggression against school support staff across schools in Glasgow City Council - an increase of nearly 30 per cent over a two year period. GMB exposed this shameful situation in the national media, more of which you can read here but against the backdrop of continued austerity we have to keep campaigning hard if we want to tackle this growing scandal. Our schools must be safe places for the staff who work there - violence and aggression at work can never be accepted as normal. There needs to be a far greater respect and recognition for the massive contribution support staff make to our kids’ education and wellbeing. Your employer and politicians need to act. Make your voice heard. Please complete and return your survey by Wednesday 28 February. This is a confidential exercise and your personal details will not be shared with your employer. This Wednesday 20 December, GMB Scotland will join our sister trade unions in West Dunbartonshire Council to call on the local authority’s councillors to reject a devastating £13 million cuts plan. Scottish local government has been hammered in the last decade by a combination of UK and Scottish Government austerity, made worse by eight years of a regressive council tax freeze policy which starved council budgets of essential funding. This austerity shame is evidenced in our rubbish strewn streets, pot holed roads, pit stop home care services and struggling education services. Enough is enough - we cannot go on like this. It is clear to GMB Scotland that the draconian proposals in this leaked document will only make our problems worse; stripping jobs, prosperity and dignity away from West Dunbartonshire. If you have any questions or would like more details, please do not hesitate to contact me at rhea.wolfson@gmb.org.uk or on 07850 575023. You may have seen press coverage earlier this week highlighting increasing levels of violence and aggression against pupil support staff. This is a direct result of GMB Scotland’s campaigning on this issue and thanks to those members who have provided us with their stories of real experiences in Scottish schools. You can read more about the figures which we have uncovered on incidents in schools by clicking on the image below. The priority of GMB Scotland is the defence of our members’ interests. We campaign to ensure you receive the proper recognition and reward for your work and skills. And let’s be clear, it is not acceptable for anyone to feel unsafe or unsupported at work. Support staff are the unsung heroes of Scottish education but too often they are treated like second class citizens in Scotland’s schools, overworked and undervalued. Enough is enough; the result of increased demands on your time and more cuts to school support budgets is just one more example Scotland’s austerity shame. Our campaigning has also prompted questions in the Scottish Parliament this week but I know that we will only see real change if we keep up pressure and continue tell the stories of our dedicated school support staff. GMB Scotland will continue our campaign to gain better recognition and treatment for the vital work of our support staff in our schools, politics and in public. After 10 Years Of Austerity Enough Is Enough! it's Time For A Proper Pay Rise! 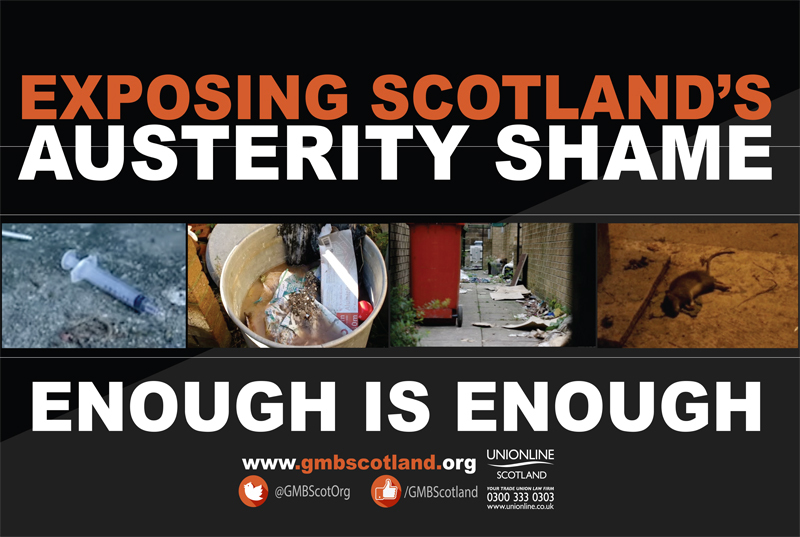 GMB Scotland Petition: After 10 Years Of Austerity Enough Is Enough! it's Time For A Proper Pay Rise!